Tuesday. It’s a day of the week that sort of gets lost in the middle. It doesn’t get the cheeky moniker like Wednesday “Hump Day,” nor is it a precursor to Friday. Yup, Tuesdays can be pretty ordinary…unless you’re an A’s fan! Here’s why: During select Tuesday home games this year (and there will be close to a dozen of them), Chevy is presenting FREE PARKING in the Coliseum lot. That’s a savings of almost $20…and admit it, sometimes parking is the make-it-or-break-it factor when deciding to go to a game. The deal gets even better for Chevy drivers. Bring your keys to the box office and you’ll score a nice savings on Field Level tickets. Here’s a video that explains a bit more. And here’s a photo from my birthday tailgate last August to show how fun the Oakland Coliseum parking lot can be for a party! Green and yellow balloons, flowers and yummy treats was the best way to kick off the pre-game celebration! 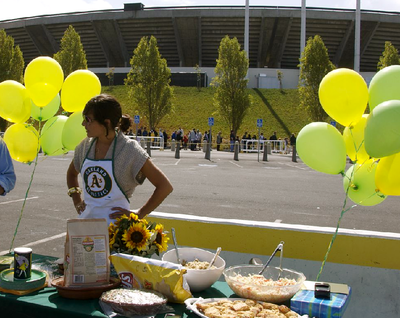 Whether for the Mariners, Angels or Rangers, we’ll see you out here at the Coliseum for free parking, a sweet tailgate and of course, and A’s win! !